Make Chapel of the Bells a special part of your partnership. 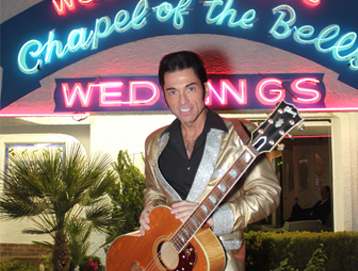 Whether you are getting married for the first time or renewing your vows, we are confident that you will have a wonderful time at our famous wedding chapel in Las Vegas. For years, repeat customers renewing their vows as often as once a year has been a big part of our business. Additionally, parents have returned to watch their children or their grandkids give new meaning to the words "holy matrimony" at our location. A lush garden greets you when you arrive at the chapel. The ceremony itself is friendly to all religions, with a non-denominational minister forging the sacred bond. 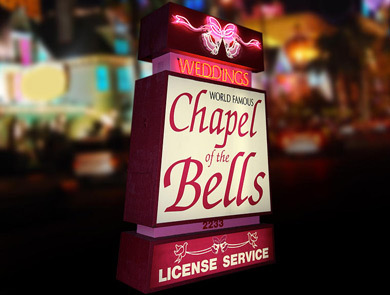 After decades of happy couples, it's easy to understand the chapel's motto: “Forever starts now.” Contact us today when you are interested in getting married in one of the top Vegas chapels for weddings. 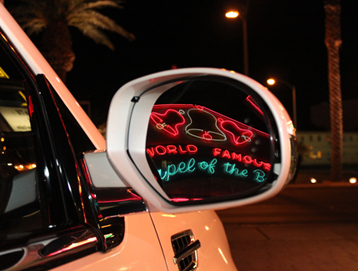 We are happy to share any necessary info with you, such as our wedding chapel packages in Las Vegas. When you visit our chapel, you'll find elegance every step of the way. 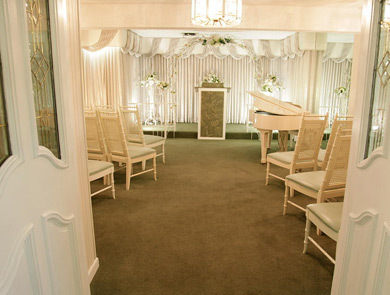 From the beautiful, white baby grand piano to the quaint and lovely chapel, our facilities are the perfect place to join two people together in an everlasting union.